1. PREHEAT oven to 350° F. SPRAY twelve 4 oz. ramekins with non-stick cooking spray. SET aside. 2. COMBINE cake mix, water, vegetable oil and eggs in a large bowl. WHISK to combine ingredients. 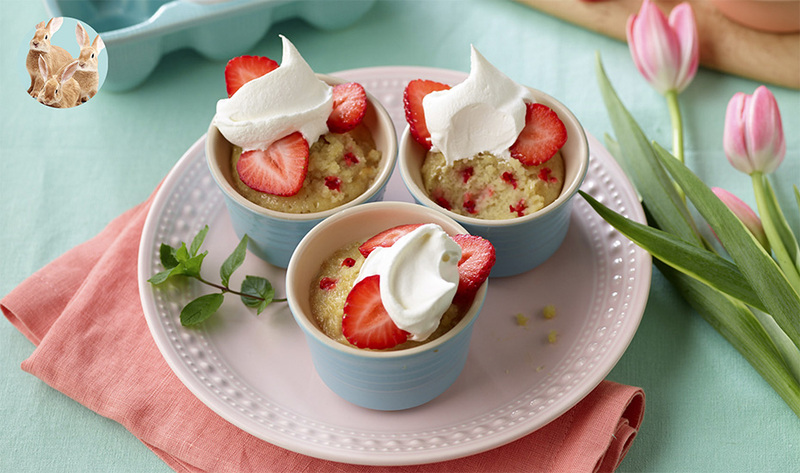 FOLD in strawberries and pour mixture into prepared ramekins. BAKE for 20-22 minutes or until a toothpick inserted comes out clean. Let COOL completely. 3. WHISK together condensed milk, evaporated milk and low fat milk in a medium bowl for the milk topping.POKE holes in the cakes thoroughly using a fork.SPOON4 tablespoons of mixture over each cake. COVER with aluminum foil and REFRIGERATEfor at least 2 hours to overnight to allow the liquid mixture to soak in. 4. PLACE whipping cream, sugar and vanilla in the bowl of a stand mixer. WHIP until stiff peaks form. SPREAD evenly over top of the cake. GARNISH each cake with 1 sliced strawberry. • Unmold mini cakes on a small shallow serving bowl or dish with a rim. • Poke holes in the mini cakes thoroughly using a fork. Spoon 4 tablespoons mixture over each mini cake. Loosely cover with aluminum foil and refrigerate for 2 hours to overnight to allow the liquid mixture to soak in. This recipe is agood source of protein, vitamin A and choline.